CWA Hall, 40 Wingecarribee Street, Bowral. 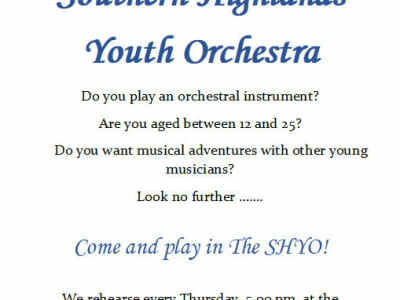 Can you play an orchestral instrument and are aged between 12-25? Then come and play in The SHYO! Rehearsing every Thursday 5pm at the CWA Hall, Bowral. 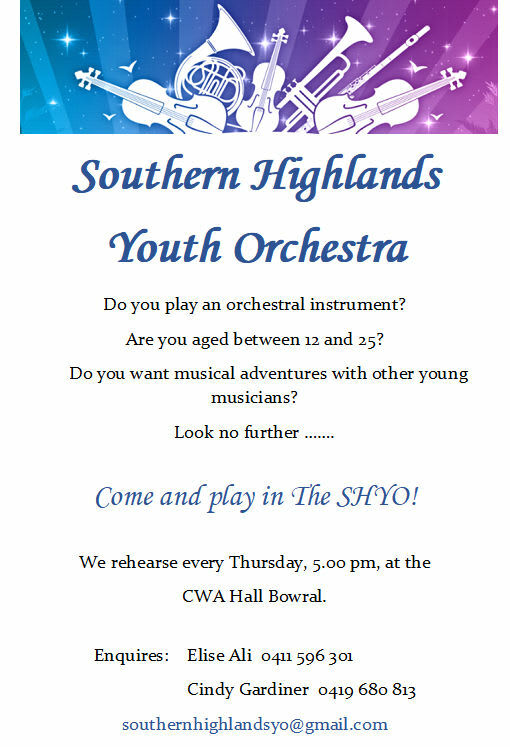 The Southern Highlands Youth Orchestra is an independent, not-for-profit organisation fostering a youth-focused orchestral community to support young musicians in the Southern Highlands. Music Director, Elise Ali, is passionate about providing young musicians the opportunity to be involved in orchestral activities, music camps, workshops and masterclasses. She considers playing and experiencing such opportunities with peers as an important part of a young musicians development. The SHYO provides these opportunities to orchestral playing youth irrespective of schools, location and teachers, whilst fostering close relationships with these schools, teachers and other community groups. Musicians will have the chance to develop community friendships, participate in specialist masterclasses and go on orchestral tours. Elise Ali has extensive experience in establishing, running and conducting youth orchestras, music camps and orchestral events on the Mid North Coast where she previously resided. In 2018, as Music Director and Conductor, she took the Mid North Coast Youth Orchestra on tour to Singapore, where along with other musical experiences the musicians rehearsed with Joshua Tan, Associate Conductor of the Singapore Orchestra and Principal Conductor of the Singapore National Youth Orchestra.